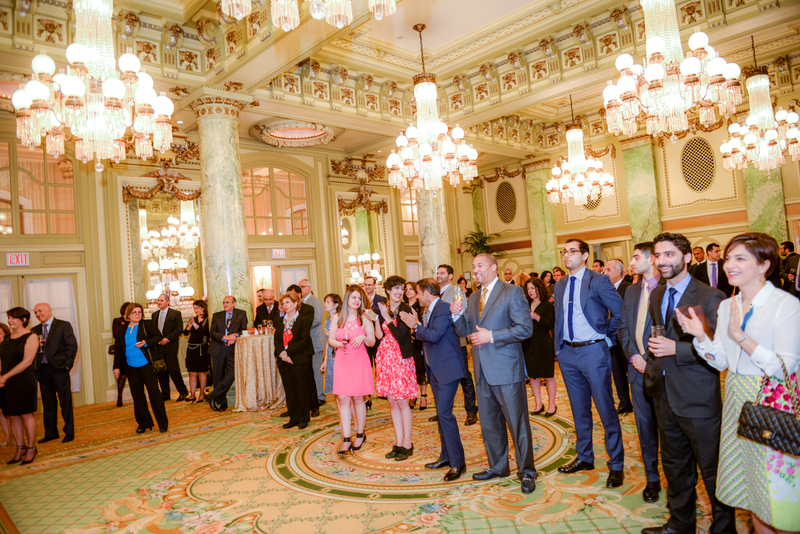 On the last day of March, about a hundred distinguished Iranian-Americans gathered at the Willard, Washington, D.C.'s most storied hotel, over authentic Persian cuisine and classical music, to celebrate the arrival of Nowruz, the Iranian New Year. The event was co-hosted by the West Asia Council and a number of leading Iranian-American organizations, including Iranian-American Community Center (IACC), NIAC, The Public Affairs Alliance of Iranian Americans (PAAIA), IAAB, Children of Persia, the Aftab Committee and the Iranian-American Bar Association. The reception showed the increasing interest among Iranian-American organizations in coming together to communicate their common vision. Unofficial estimates suggest that the United States is home to more than one million Iranians. Yet, as one of the most highly educated and successful minority groups in the country with substantial wealth and a long list of individuals achievements, Iranian-Americans still punch below their weight in maintaining a robust presence capable of having meaningful political, social, and cultural impact in America. Fortunately, the tide is changing. Second-generation Iranian-Americans in particular have begun to overcome the political and cultural schisms that plagued the integration efforts of the previous generation. As a result, young and well-connected Iranian-Americans are starting to recognize more fully the ways in which activism, civic engagement, and philanthropy form the core of democracy in America. One effect of this is that the membership base of Iranian-American organizations continues to grow and formerly disparate groups are now seeing increased collaboration among members. I had an opportunity to engage in a dialogue via email with five members of leading Iranian-American organizations who co-hosted the Willard Nowruz reception. The interview aims to delve into the insights of community leaders regarding the significance of the Iranian-American community on the future of America, Iran, and beyond. Morad Ghorban, Director of Policy and Government Relations, Public Affairs Alliance of Iranian-Americans (PAAIA) was one of the four leaders interviewed. "Iranian Americans are increasingly engaged in the American civic and political process at all levels of government and in the public debate. The process has taken many forms--from individuals seeking and winning elected office to the creation of organizations designed to further the interests of the community and to give Iranian Americans a voice in the American civic process. Examples of increased civic and political engagement include efforts to obtain an accurate count of Iranian Americans through the Decennial Census as well as the election of Cyrus Habib, a Democrat from Washington State, who marked a historical milestone by becoming the first Iranian American to be elected to a state legislature in 2012. Neither of these success stories would have been possible without the support of civically-engaged Iranian American individuals and community organizations. While Iranian Americans have assimilated into the fabric of American life and are becoming more politically self-confident and assertive, they maintain strong ties to Iran. A 2014 National Public Opinion Survey of Iranian Americans by the Public Affairs Alliance of Iranian Americans shows that the vast majority of Iranian Americans have family in Iran and favor policies that would advance greater people-to people relations with Iran through cultural and educational exchanges. Moving forward, Iranian Americans can play an important role in helping the people of Iran and the people of the United States constructively engage with each other." "U.S. history has taught us that the most successful immigrant groups are those who cherish and maintain their unique heritage and culture, while concurrently integrating into the proverbial melting pot. The Washington, D.C. metropolitan area is home to an estimated 85,000 vibrant Iranian-Americans who form a community spanning many generations, ethnic groups and religions. The Iranian American Community Center's (IACC) vision is to share and preserve Iranian culture in the Washington, D.C. metropolitan area through the establishment of a community center that serves as a hub for educational activities, cultural events, and community services. The establishment of such a center in the Washington, D.C. area will serve two parallel goals: to preserve and celebrate the cultural heritage of Iranian-Americans living in the US, and to serve as a resource for non-Iranians to learn about the 3,000-year-old Iranian history and civilization. Given the importance of the capital region to the U.S. and the world, the launch of the Iranian-American Community Center will provide our community with a "home", and serve as a bridge between Iranians and numerous other communities, while working to harness the vast capacity of a growing member of American society." "The traditions of American democracy have long established that the influence of a group plays a guiding role in the extent and intensity of its participation in any and all elements of the American political system--including processes such as participating in public debate, volunteering, voting, political fundraising, and running for office, The system is set up to reward intense participation while creating consequences for apathy or self-marginalization. This is exemplified by the way the Jewish community has been successful in significantly impacting the political system in America. Jewish Americans, in fact, have many lessons to teach Iranian-Americans, in particular ones related to commitment and prioritization. Generally speaking, the first generation of Iranian-Americans targeted financial success, which in turn granted them the ability to offer their children excellent and unparalleled academic opportunities. It's little surprise, then, that when measuring for income the United States' Census data show Iranian-Americans to be one of the country's wealthiest minority groups. With that proverbial box now checked, the next challenge is to achieve community success. The second and third generations of Iranian-Americans will be tested regarding their means of facilitating cultural identity and maintaining tangible connections to their ancestral home. To integrate and to succeed, these new generations need to learn from the very best in the business: the Jewish Diaspora." "With nine chapters in various metropolitan cities across the United States, the Iranian American Bar Association ("IABA") is one of the most prominent minority bar associations in the United States. IABA chapters hold networking events, publish articles on key legal developments, and provide outreach to lawyers and law students. IABA also provides annual scholarships to law students and provides lawyer mentors for those seeking guidance. Moreover, IABA helps serve the Iranian-American community and the community at-large by providing legal advocacy on important issues and maintaining relationships with key members of various judicial systems. Several chapters such as DC, Los Angeles, and New York hold annual Norooz events for members to celebrate the Iranian New Year. At these events, it is common to have guest speakers from the community, such as prominent judges and local government officials. The chapters also hold holiday events to celebrate the Christmas and Hannukah seasons. These activities illustrate that we are proud to be both Iranian and American. IABA often joins with other organizations to further unite the Iranian-American community. For example, the Washington DC Chapter has held several joint events with the Iranian American Medical Society of Greater Washington. 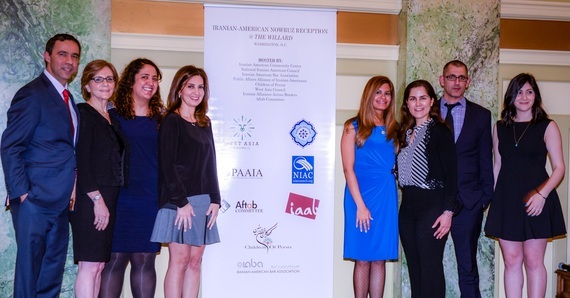 IABA strives to preserve the good name of Iranian-Americans in the United States and aims to empower thousands of Iranian-Americans who work as legal professionals and the community at large." "The Obama Administration has been the most inclusive and open in history towards the Iranian-American community: the four Iranian-American Roundtables held at the White House over the past three years featuring leading Administration officials and the unique White House Nowruz Reception hosted by First Lady Michelle Obama on March 11, have demonstrated the value that the U.S. Government attaches to the diversity and inclusiveness of America's public institutions. And yet, despite these unprecedented outreach efforts, the hitherto fraught relationship between the U.S. and Iranian governments and the extensive sanctions on Iran, have worked to undermine the ability of Iranian-Americans to serve as ambassadors of goodwill between the two countries. In a related vein, Washington, D.C.'s leading universities (Georgetown, George Washington and American) have yet to establish Endowed Chairs in Iranian studies, which would help raise the level of knowledge on the regional and international importance of Iran, and the need to better integrate it into regional and international security and economic institutions. Any thaw in the U.S.-Iran relationship is likely to change this situation for the better, and enable the Iranian-American community to contribute even more substantially to America's global role and responsibilities, while promoting international peace and development."